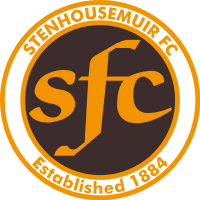 Stenhousemuir FC is a semi-professional football club from the small town of the same name, that adjoins Larbert and is located a couple of miles north of Falkirk in the Central Lowlands of Scotland. The club was formed in 1884 after breaking away from Heather Rovers; another local club. After spells playing at Tryst Park and Goschen Park, ‘The Warriors’ moved into their Ochilview Park home ground. Stenhousemuir reached the semi-final of the Scottish Cup in 1903, before being defeated 4-1 at home to Rangers. In 1921-22 the club became members of the Scottish League for the first time. In 1928 Ochilview Park got a new Main Stand after the old structure burnt down. In the 1936-37 season Dundee United were hammered 9-2. A record crowd of 12,500 flocked to Ochilview Park for the Scottish Cup quarter final tie against East Fife in 1950. The following year the ground staged the first ever floodlit game in Scotland as the Warriors took on Hibernian after the lights had been paid for by local butcher Tommy Douglas. The 1960-61 season saw the team finish in third place in the league, with Robert Taylor netting thirty two goals. Stenhousemuir’s League status was threatened in the summer of 1964 as Rangers proposed that they along with four other clubs be removed as they had been the worst supported clubs over the previous three seasons. The club rallied and won support from a number of clubs including Celtic, Hamilton Academical and Airdrieonians to defeat Rangers plan a few seasons later. Ironically the Warriors won 2-1 at Ibrox against Rangers in the League Cup in 1972-73 to knock out the European Cup Winners Cup holders. The Scottish League was restructured for the 1993-94 season to include four divisions. This enabled Stenhousemuir to leave the bottom tier for the first time as they were placed in the Second Division. The next few seasons would be the most successful in the history of the club. In the 1994-95 season the Warriors embarked on a tremendous Scottish Cup run as St Johnstone and Aberdeen were both dispatched before the run ended at the quarter final stage at Ochilview Park as Hibernian ran out 4-0 winners. 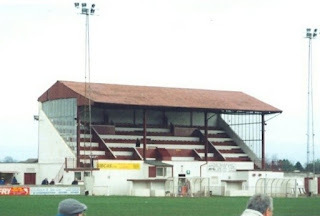 The old covered standing area on the south of the ground was removed to be replaced by a new seated Norway Stand, thus named owing to a sponsorship deal with the Stenhousemuir Norwegian Supporters Club. In 1995-96 Stenhousemuir lifted the Scottish Challenge Cup as Dundee United were beaten 5-4 on penalties after a 0-0 draw at McDiarmid Park in Perth. However, the run petered out as the club were relegated for the first time in their history in 1997-98 as the team found themselves in the Third Division. In 1999 the old ‘Dolls House’ seated stand on the north side of the ground was demolished as it no longer stood up to the safety requirements. Another first followed the very next season as Stenhousemuir won promotion back to the Second Division, before suffering another demotion in 2002-03. The club had tenants for the 2003-04 campaign as Falkirk left Brockville Park and were awaiting their new stadium to be built. A new roofed terrace was constructed at the Tryst Road end of the ground in 2005. The pitch at Ochilview Park was replaced by an artificial surface for the 2007-08 season. East Stirlingshire became new tenants from the summer of 2008. The 2008-09 season saw the team reach the end of season play-offs aided by the goals of Scott Dalziel and Kevin Motion. Queen’s Park were defeated in the semi-final before a win against Cowdenbeath on penalties saw Stenhousemuir return to the third tier Second Division. A couple of flirtations with relegation were countered by an upturn in fortunes. The Warriors were defeated by Rangers in the semi-final of the Scottish Challenge Cup in 2013 under the management of Martyn Corrigan. His replacement Scott Booth lasted a year before his assistant, Brown Ferguson took over. Ferguson’s side ended in the season having to save their League One (as the third tier had been renamed) place via the play-offs. East Fife were beaten before Queen’s Park were overcome 2-1 on aggregate as Stenhousemuir stayed up. Ferguson was rewarded by being appointed as the permanent manager. Stenhousemuir FC will play in the SPFL Scottish League One in the 2015-16 season. My visit to Ochilview Park had been totally unplanned until half an hour before I arrived. I was in the area for that afternoon’s clash between Falkirk and Hibernian. My planned visit to nearby Camelon Juniors had gone smoother than I anticipated and found myself having to wait twenty minutes for the train back to Falkirk. It was a cold day, with snow on the ground from the previous afternoon’s deluge. As a train was due a couple of minutes later for the short ride to Larbert, and I’d had seen enough of the pub the previous day, I decided to go for an additional ride. After a quick look at the map at Larbert station, I was soon marching along Main Street, past ‘The Brae’ which marked the border between Larbert and Stenhousemuir and then onto King Street, Tryst Road and then Gladstone Street to arrive behind the Main Stand. All gates were closed and the surrounding walls were large and imposing. It looked like any hope of a look inside was zero. However, I wasn’t quite done. When I turned in from Tryst Road I noticed a further gap in the houses further up. I went to investigate. It led behind the north side of the ground and the Warriors Social Club, which was open for business. Already a few punters were having a drink and watching the Ross County v Aberdeen game. I asked the fella behind the bar if there was any chance of a look inside? He couldn’t have been more helpful! I was taken behind the bar and through the back storage room and out of a door that took me inside the ground. He was a bit shocked when I wanted to see it in the snow. I explained that I was up for the game at Falkirk Stadium and I’d been in Hull for the game at the KC the day before. He left me alone so I could take some shots. The pitch was covered in a good layer of snow, with the Warriors game being abandoned half way through the previous afternoon. Ochilview was a smart venue perfect for the needs of its hosts. A large covered terrace was behind the Tryst Road end, which was what most fans of my age yearn for at their club home ground. The far side had the seated Norway Stand in the middle third of the pitch. The near side had a fair bit of flat open standing, which was mainly used for car parking, with a TV gantry on the half way line. The far end had a narrow bit of open standing, with two five-a-side pitches beyond where grass banking once stood. Everything was neat and tidy. I asked the gents in the bar if there was anything left of East Stirlingshire’s old Firs Park ground. It didn’t sound very promising, but as I could take a bus from the end of the road to the former venue, I decided to give it a go. The bus was on time and I was soon in Falkirk ready for the next part of my adventure.